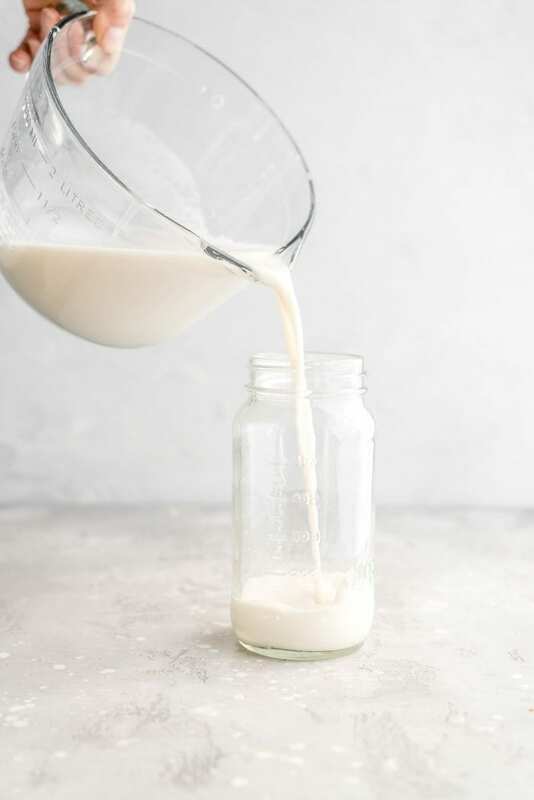 Learn how to make oat milk with this easy homemade recipe. All you need to make it is a few basic kitchen tools, 5 minutes and 2 ingredients. You can use your delicious, creamy oat milk with cereal and coffee, in smoothies and for drinking. If you’re using the oat milk in sweet baking recipes, for tea and coffee, in cereal or for drinking, I’d recommend adding a tiny bit of sweetener plus the vanilla and sea salt. If you’re using it in savoury recipes, you can leave it plain or just add a tiny pinch of sea salt. If you plan to use the milk in coffee, adding 1 tsp of coconut oil results in a creamier oat milk that froths nicely. Blender. You can use any blender to make homemade oat milk. I recommend a Vitamix. My most-loved kitchen tool, which makes easy work of this recipe and the smoothies you can make with it. If you can invest in one, go for it. You will not regret it! 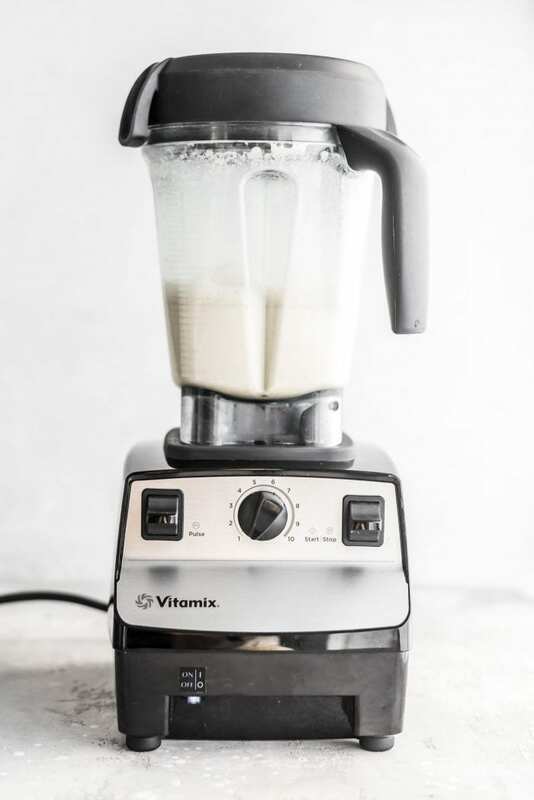 Click here to shop Vitamix. 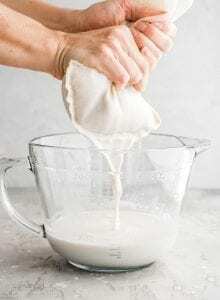 Nut milk bag (or cheesecloth or old t-shirt). I would highly recommend ordering a nut milk bag from Amazon if you don’t have one. They’re inexpensive and perfect for making quick oat milk and other homemade nut and seed milks. If you don’t have one, you can strain your oat milk through cheesecloth, fine mesh sieve or even a cut-up old t-shirt. 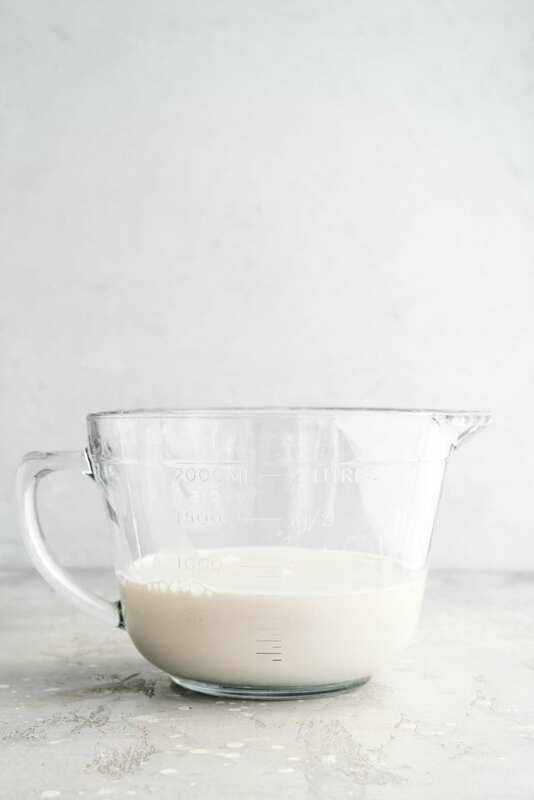 To use cheesecloth or an old t-shirt, cut a large piece big enough to fit over your bowl or measuring cup, pour the oat milk over then gather up the sides of the square and twist to squeeze the oat milk through. Large bowl or measuring cup. I love these large measuring cups with a pouring spout for straining the oat milk into. Storage container. I like storing my oat milk in a mason jar with these plastic lids but any sealable jar or bottle works. Step 1. 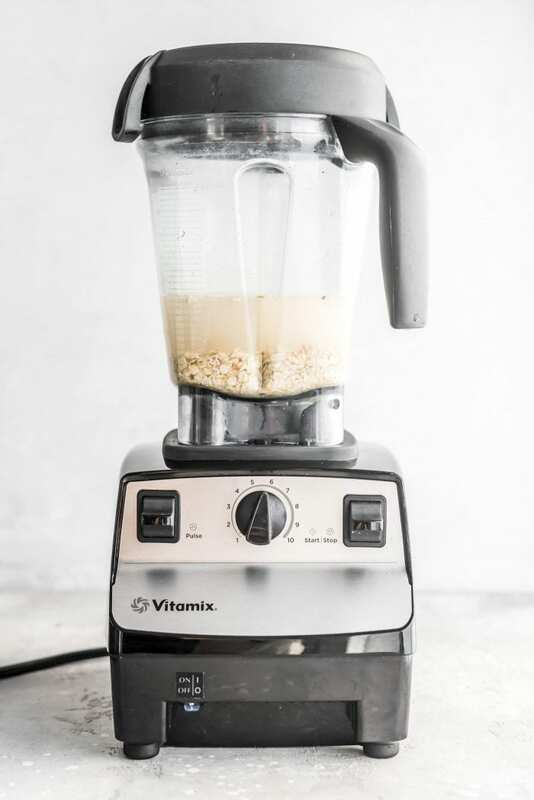 Add the oats and water to a blender and blend on high for 20-30 seconds until smooth. At this point you can also add any optional ingredients such as 1-2 pitted dates or 1 tbsp of maple syrup for sweetness, a pinch of sea salt or some vanilla. Some people like to add 1-2 tsp of coconut oil as well for a thicker, creamier milk. If you’d like to try chocolate oat milk, add 1 tbsp of cocoa powder and a sweetener of choice. If you’d like to use dates for sweetening, I’d suggest adding them to the blender with the water first and blending until smooth, then adding the oats and proceeding. This prevents over blending the oats which can cause them to get slimy. Step 2. 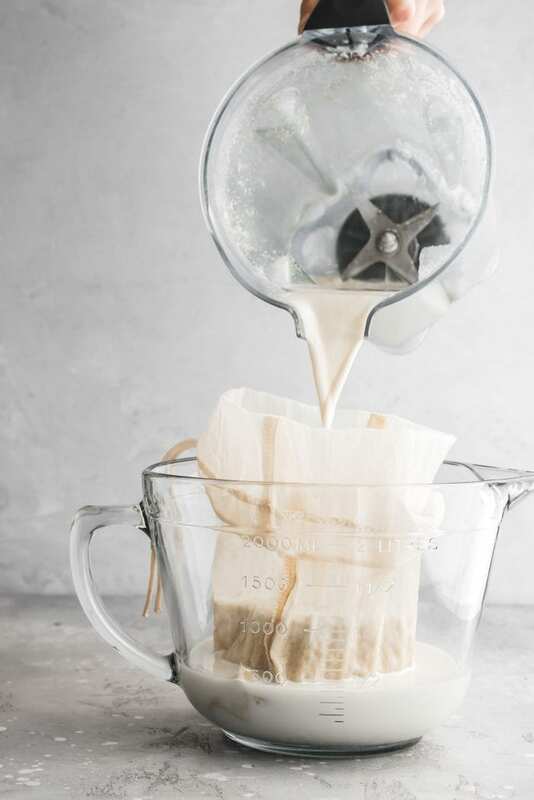 Strain the blended oats and water through a nut milk bag, cheesecloth or fine mesh sieve and into a large measuring cup, preferable with a pouring spout. If you don’t have a large measuring cup with as spout, you can strain it into a bowl then use a funnel (or a steady hand) to transfer it to a jar. You can also strain it directly into a mason jar, it’s just a little messy this way! The oat milk can also be left unstrained. It will be quite thick but this is fine is you plan to blend it into smoothies. Otherwise, I’d suggest straining it at least once. Some like to strain it twice but I think once is plenty. Step 3. Pour the strained milk into a glass jar. It’s ready for use or can be stored in the fridge for up to 5 days. For drinking. I’d recommend adding a sweetener if you plan to enjoy it as a standalone beverage. In Smoothies. Oat milk is great for smoothies and I make it often when we’re out of almond or cashew milk. Try it in my Vegan Carrot Cake Smoothie or Sweet Potato Smoothie. In Coffee or tea. It froths quite nicely! I love it in coffee. 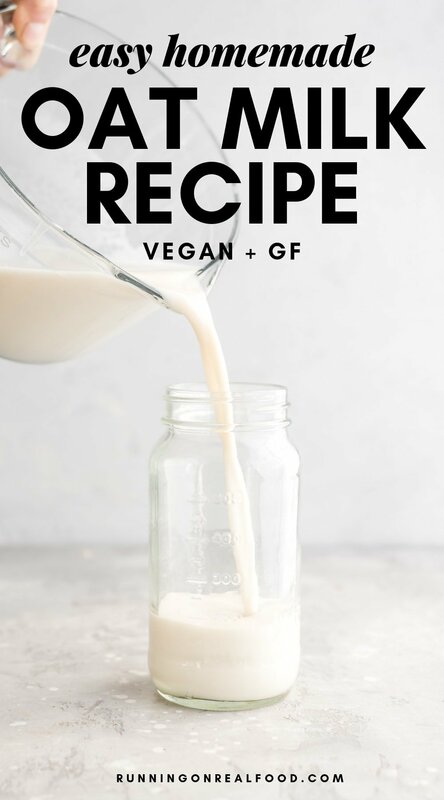 You can also try my Vegan Oat Milk Coffee Creamer as an alternative recipe. Just note that you can’t use it in electric milk frother that heats or steams the milk but a hand held frother works great. With hot or cold cereal or granola. This is my favourite way to use it. I love it with a bowl of granola or cold cereal. It’s so yummy! It can also be drizzled over hot oatmeal. In baking. You can use homemade oat milk in vegan recipes such as pancakes, muffins or cookies that call for nut or seed-based milk. You could also use it to make my Easy Banana Baked Oatmeal. The leftover pulp from making oat milk can be discarded with organics or used in one of the ideas below. One batch of oat milk doesn’t really leave much leftover pulp, so I usually just discard it but it’s also great in any of these uses. Make Porridge. Try replacing the oats in my Simple Creamy Banana Oatmeal for extra creamy porridge or just mix the oat pulp into any porridge or overnight oats. Add to Smoothies. Add any leftover oat pulp to smoothies for a creamy texture and a boost of fiber. Try it in my Chocolate Banana Smoothie or Lemon Blueberry Smoothie. Make Cookies. You can add the oat pulp to recipes like my Flourless Banana Oatmeal Cookies. Add to No-Bake Energy Balls. You could replace some of the oats in my Cinnamon Energy Balls with oat pulp. Make Quick Apple Crisp. Mix the oat pulp with 1 tbsp of maple syrup or coconut sugar or chopped dates, a couple tablespoons of shredded coconut, cinnamon and a pinch of sea salt. Crumble over a chopped apple and bake in the oven for 15 minutes for a quick and healthy “crumble”. Make Granola. You could replace some of the oats in my Easy Peanut Butter Granola with Oat Pulp. This does not include any add-ins but does account for removing the oat pulp. If you use more water, the macronutrients in each serving will be even less. It’s very low in calories since you’re removing much of the oats when you strain it. 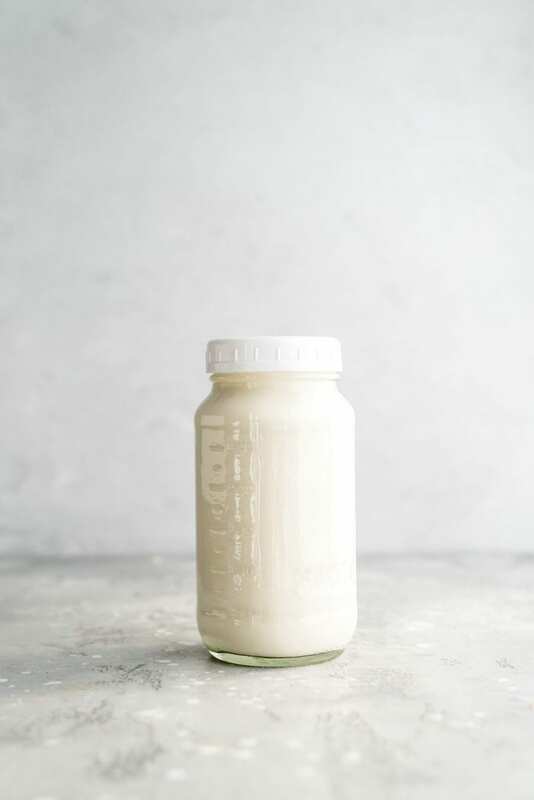 Homemade oat milk varies from commercial varieties in that they’re often fortified with calcium and vitamin D, A and B12. 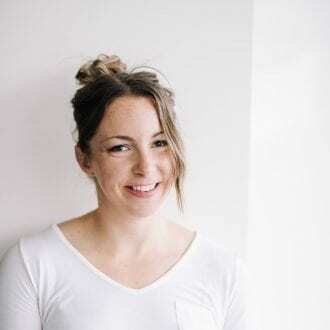 I like store-bought milks for that reason but usually choose unsweetened cashew or almond milk from the store and make simple and inexpensive oat milk at home. Oat milk is so easy and cheap to make at home I don’t think it’s worth buying. Oat milk is allergen-free. Oat milk is a great choice for those with dietary restrictions since it’s vegan, lactose, soy and nut-free. It can also be gluten-free if made with gluten-free certified oats. May Lower Cholesterol. Oat milk contains beta-glucans, a soluble fiber with heart health benefits. Beta-glucans form a gel inside the gut which binds to cholesterol, reducing absorption. Enjoying oats often may help lower total blood cholesterol, especially LDL, or “bad” cholesterol. Anti-Inflammatory. Oats contain avenanthramides, an antioxidant with anti-inflammatory properties that’s also thought to help lower blood pressure. B vitamins and magnesium. Even with out being fortified, oats are a source of B vitamins, iron, zinc and magnesium. Don’t over blend. Blending for too long will heat the oats and may cause some sliminess. I’ve found 20 seconds on medium to high speed in my Vitamix to be just right. I would suggest keeping it to under 1 minute to prevent the oats from heating at all. Over blending will definitely make them goopy and slimy, so err on the side of caution here. Soak and rinse first? I’ve actually found best results without soaking the oats first but many other recipes suggest soaking first. If you do want to try soaking them, follow the steps listed in the FAQ section below. Personally, I don’t soak the oats first! Do not heat. Oat milk can’t be heated up. If you want to test this, microwave it for 30 seconds! Yuck. You’ll get a slimy, goopy, unusable mess. Oat milk can be added to hot beverages or drizzle over a hot bowl of oat milk but do not heat it stovetop or in the microwave. Homemade oat milk is nutritious, sugar-free and low in calories. Store-bought oat milk nutrition will vary by brand but typically they are higher in calories and carbohydrates than say almond milk. Store-bought oat milk is also often fortified with vitamins such as B12 and vitamin D.
Is oat milk high in sugar? Nope. Well, certain store-bought brands have added sugar but homemade oat milk is sugar-free unless you add sugar to it. Not really. Oat milk tastes like plain oats. To sweeten it you can use any number of natural sweeteners such as dates, maple syrup, agave, stevia or monk fruit. What is oat milk made from? Oat milk at its simplest is made from oats and water, that’s it! From there, you can add flavour enhances such as sea salt, vanilla and a date for sweetening. Can you bake with oat milk? Yep! Oat milk is great for making pancakes, cookies, muffins and other baked recipes. Does oat milk have to be refrigerated? Yes. I would suggest storing your oat milk in the fridge, however, it would be fine to take on-the-go in an insulated lunch bag or water bottle if needed. It can be if you use gluten-free certified oats. Oats are naturally gluten-free but if your’e celiac or need to be extra careful with gluten, choose GF-certified oats such as Bob’s Red Mill or One Degree Organics. Do I have to soak the oats first? Add the oats to a bowl and cover with water. Strain through a fine mesh sieve, rinsing well to remove any slime. Discard the water they soaked in. Use the soaked oats to proceed with the recipe. Can oat milk be heated? Unfortunately oat milk cannot be heated. It turns into gelatinous slime and you’ll end up having to throw it away. It can be added to hot items like coffee, tea and oats but don’t heat it stovetop or in the microwave. 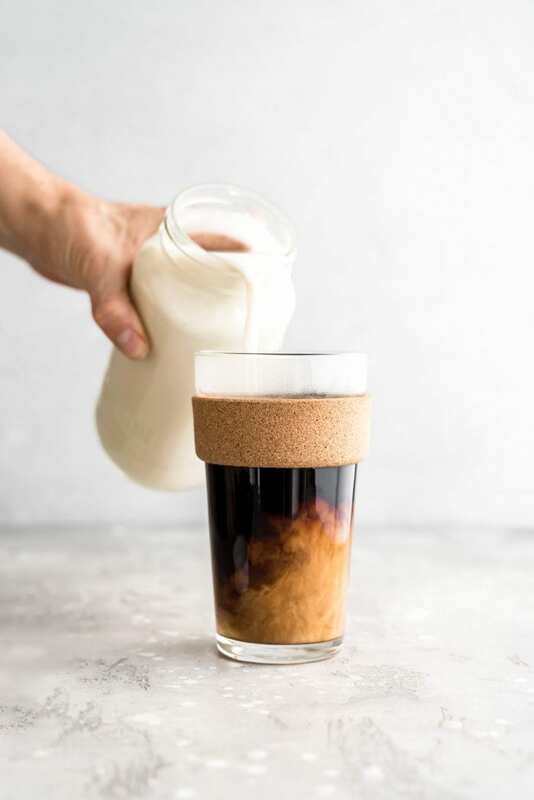 Can I use oat milk in coffee? Yep! Oat milk is an excellent dairy-free alternative for coffee and tea. How long does oat milk keep? Store oat milk in a sealed container in the fridge for up to 5 days. Shake well before use as it will naturally separate. My oat milk separated. Is it bad? Nope! If your oat milk separates, which it will, don’t worry. It’s natural for homemade nut and oat milk to separate. Just give it a good shake before using. Unlike store-bought plant milks which have added emulsifiers to keep them from separating, homemade nut milks do not. How can I sweeten oat milk? 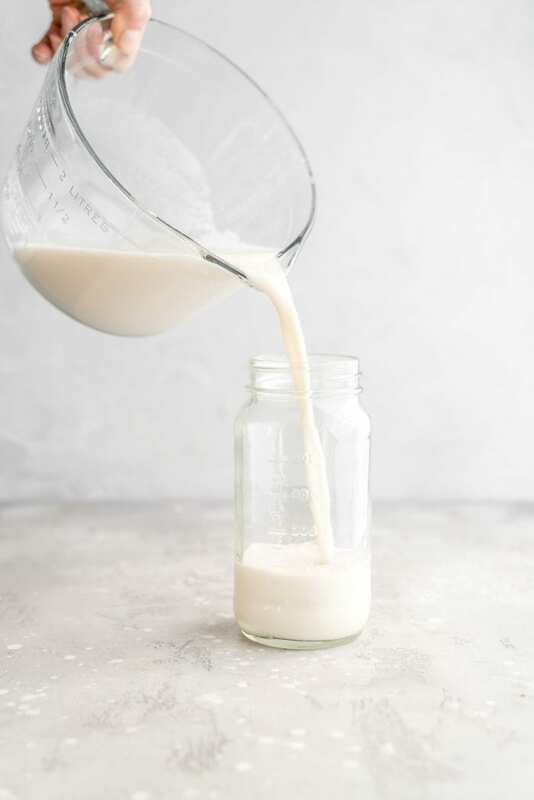 You can sweeten oat milk by adding dates, pure maple syrup, coconut sugar, yacon syrup, agave syrup or another unrefined sugar of choice. I prefer not to sweeten oat milk since I usually use it for smoothies or coffee and don’t find it needs the additional sweetener. If you’d like to add a bit of extra sweet flavour to yours, I’d recommend adding 1-2 pitted dates or 1 tbsp of liquid sweetener such as maple syrup. Half a teaspoon of vanilla extract also makes a delicious addition. Can I make chocolate oat milk? Sure can! Blend in 1 tbsp of cocoa powder and use a sweetener such as maple syrup or dates. What kind of oats to use for oat milk? 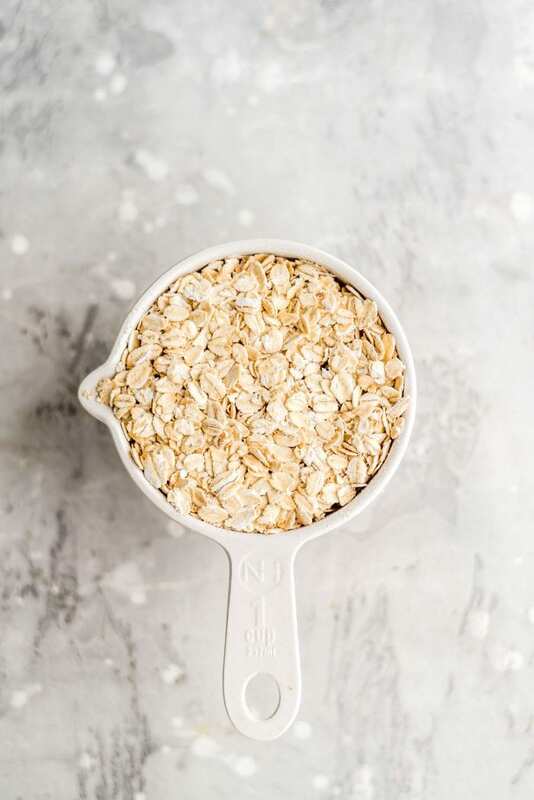 I would recommend using rolled oats (old fashioned oats) for best results, however, you can also use steel cut oats, quick oats or minute oats. I’ll admit this milk is not for everyone as it does have a pronounced oat taste, especially if you don’t add sweetener. It’s quite plain without adding a pinch of salt, vanilla and sweetener but I like it! It depends what you plan to use it for too. If you’re just going to drink it, I would recommend using the optional ingredients for add more flavour. I love it though so don’t be afraid to give it a try! It’s inexpensive so you can’t really go wrong and you can always use it in smoothies if you don’t love the taste. 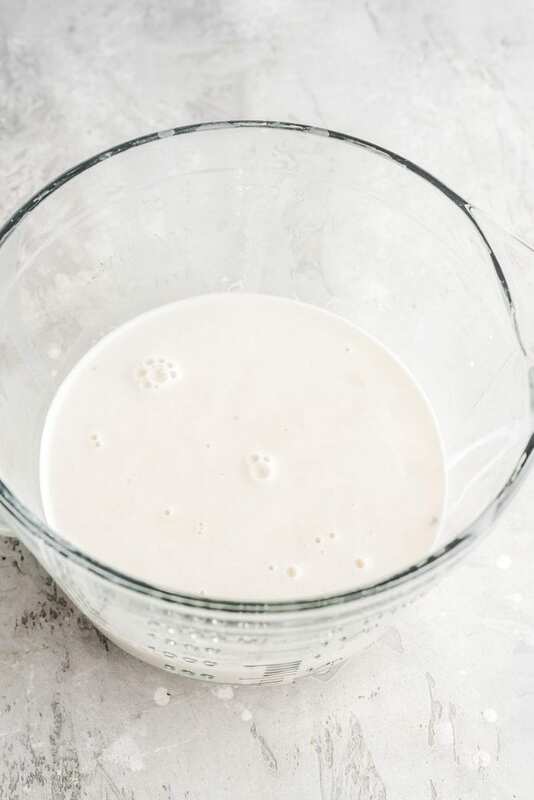 For an alternative to this recipe, check out my post on how to make almond milk for a delicious homemade nut-based milk. For a thicker milk, suitable for adding to coffee, try my Vegan Oat Milk Coffee Creamer. Oat milk is incredibly easy to make at home. This wonderfully healthy and creamy milk can be use in coffee, cereal, porridge, smoothies and for drinking. Add the rolled oats and 3 cups of water to a blender. If you’re adding salt, sweetener or vanilla, add those as well. Blend on medium to high speed for 30-60 seconds until smooth and creamy. I blend it for 20-30 seconds in my Vitamix. See how you like the consistency with 3 cups water and add more to adjust. I use 3.5 cups water but feel free to increase that to 4. 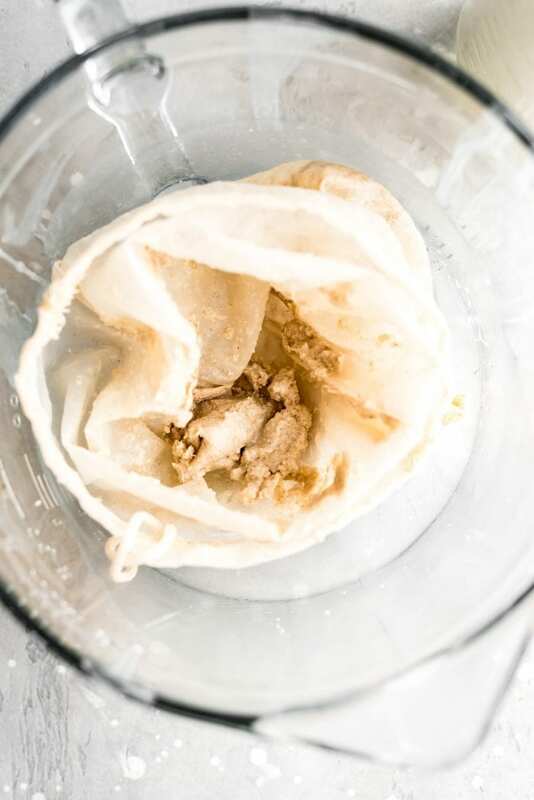 Place a nut milk bag in a large bowl or glass measuring cup, or place a large piece of cheesecloth over the bowl, then carefully pour the blended oat milk through the bag or over the cheesecloth. 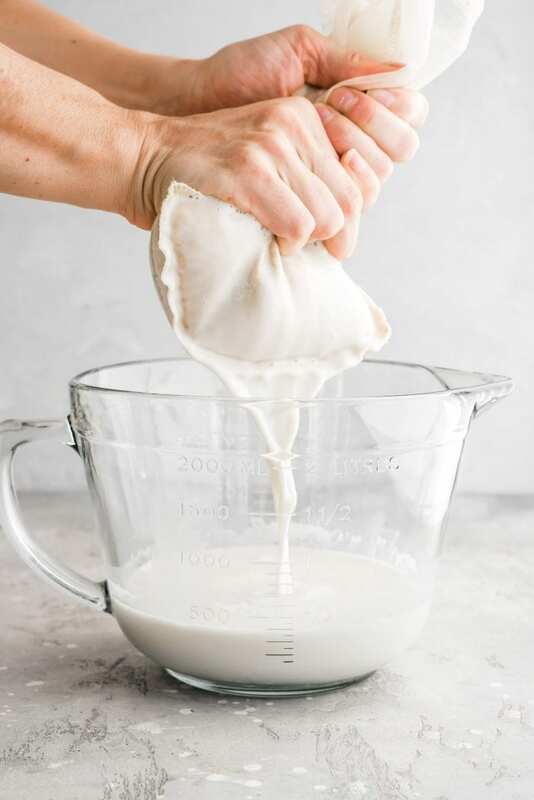 Use your hands to squeeze the liquid through the bag until all the milk has been squeezed through and you’re left with a clump of oat pulp in the bag. For extra smooth oat milk, you can strain it twice but I find once to be sufficient. Pour the strained oat milk into a storage container of choice such as a mason jar. Store in the fridge for up to 5 days. Shake well before use as it will naturally separate. I like the consistency of oat milk made with 1 cup oats to 3.5 cups water. Start with 3 cups, blend and test the thickness, then add up to 4 cups to adjust to your preference. Anywhere between 3 and 4 cups works well, it just depends how thick you want it. If you’re using any of the optional ingredients, blend, test, adjust and blend again, as needed. If you’d like to use dates for sweetening, I recommend adding them to the water first without the oats and blending until smooth. Then add the oats and proceed. This prevents over blending the oats. This oats milk recipe sounds easy to make, low-cost and delicious. I love oats which have I for breakfast every day but using bought non-dairy milks which contain added vitamin B12 because I´m vegan. I was thinking how to add this vitamins to this milk so I may use every day for breakfast and any other meals requiring plant milk. Thanks so much for any suggestion. I use store-bought almond and cashew milk for the B12 too but I like making my own oat milk since it’s so cheap and easy! I usually have both on hand. I also take a B12 supplement. Let me know if you try it!